Yet again, development on steep hill slopes in Kuala Lumpur has proven to be disastrous. This time, it seem to have taken 20 yrs… given the retention walls were first built in 1992 according to the Mayor of KL. Bkt Setiawangsa landslide: Rain has authorities worried about further damage – Nation | The Star Online. THERE are plans to tear down and rebuild the Sivan Temple in Bukit Gasing which is in a bad shape. Chairman of the interim temple committee, Maharathan Thuraiswamy, said there was a need to scale down the temple which is located on top of the hill due to safety reasons. The committee plans to demolish the existing two-storey structure and build a single-floor temple. “I have plans to demolish the existing double-storey temple and build a single-storey temple. I was advised by my engineers that due to the poor workmanship of the temple it is unsafe for public. “Due to the rainy season, we fear the building may collapse,” said Maharathan. A check by Streets recently found the temple in a deplorable condition. Long lines of cracks had appeared on the roof and walls and water had also seeped through the roof. There was also a large pool of stagnant water at the rooftop which could become a potential mosquito-breeding ground. Mini “stalactites” had also formed from sections of the roof, believed caused by water which had been seeping through the walls over the years. The poor condition of the temple was highlighted in a letter sent by Maharathan to the Selangor Menteri Besar Tan Seri Abdul Khalid Ibrahim office stating the committee’s intention to rebuild the temple. The letter was forwarded to the Petaling Jaya City Council (MBPJ) and the matter was subsequently raised during the full-board meeting on Wednesday. However, during the full-board meeting chaired by Deputy Mayor Puasa Md Taib, he said the council would not make any decision on the matter and would leave it to the state government related to the matter. State executive councillor Dr A. Xavier Jayakumar, who had been tasked to look into the matter, said he was not in favour of demolishing the temple. However, he would discuss the matter further with the council and the new mayor Datin Paduka Alinah Ahmad. The Sivan Temple started as a shrine some 40 years ago. About six years ago, it was rebuilt to the present size by certain parties without the approval from the authorities. It is now a two-storey temple with three multi-purpose halls. The temple was closed for over six years due to the rebuilding works. However, small groups of devotees still pray daily at a smaller section of the temple. When the temple was rebuilt, it incorporated gigantic architectures depicting religious idols. Some had claimed that the huge temple complex was unsafe as it was located on a hilltop which was prone to landslides. In fact, the expansion of the temple made it to the headlines in 2007 after it caused a landslip. The council issued a stop-work order and compound to the then temple management for violating the Street, Drainage and Building Act. The landslip was rectified by the former temple management and was later certified by Public Works Institute of Malaysia (Ikram) in 2008. The reconstruction work at the temple soon intensified. The council later received a complaint that a portion of the land facing the KL side of Bukit Gasing had given way. MBPJ issued a second stop-work order and requested a proposal plan for the temple reconstruction works. A 150m landslide occurred at the northeast of Sivan Temple on Jan 6 last year. Work to stabilise the slope was allowed to continued by the former temple committee. Not long after that a court tussle involving two groups claiming to be the temple’s rightful committees began. On Oct 8 this year, the Shah Alam High Court held that Maharathan Thuraiswamy and four others could continue managing the temple until the disposal of a suit brought by them against Datin Seri Indrani Samy Vellu and three others which is still pending. SHAH ALAM: The Selangor government has provided a hotline for the public to report any early signs of landslides, following heavy rain in the state. Mentri Besar Tan Sri Khalid Ibrahim said the toll-free line, 1-800-88-2824, would operate round-the-clock from Monday. Complaints received would be channeled to the authorities immemdiately for follow-up action, he told a media conference at his office here Wednesday. Watch your step: Some of the hiking trails in Bukit Gasing show signs of erosion. It is becoming increasingly dangerous with heavy rainfall recently. BUKIT GASING residents and regular hikers want immediate remedial works for the hill after a sudden surge of erosions and landslips. The Association of Backpackers Malaysia (ABM) spotted danger spots all over the forest trails that were regularly used by hikers on a daily basis. 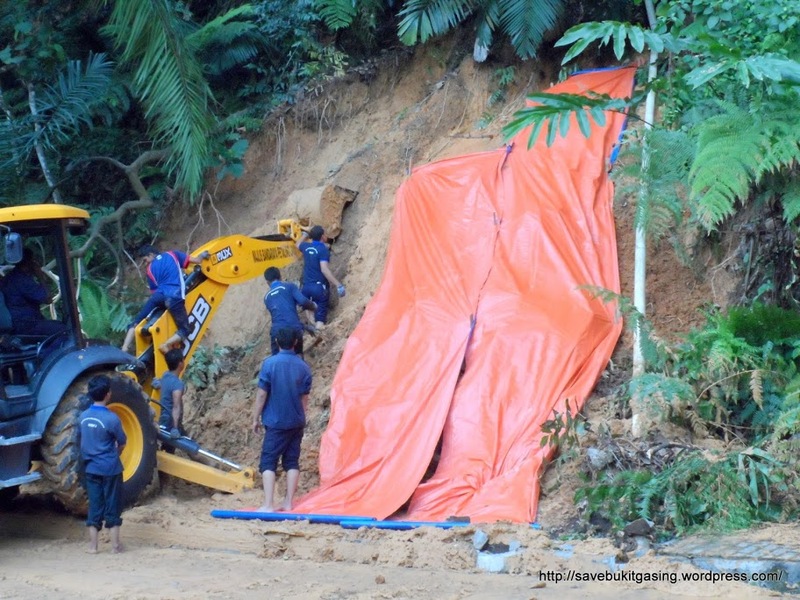 PETALING JAYA (Dec 6, 2012): Bukit Gasing residents have again urged the local authority not to approve development on the hill slope following the discovery of two more sites of soil erosion and landslip in the area three days ago. Bukit Gasing Joint Action Committee member Gary Yeoh told theSun earlier this week the residents were concerned that development on the fragile slope would pose a danger to them. “We want the Petaling Jaya City Council (MBPJ) to conduct engineering and environmental studies to determine the causes of the soil erosion,” he said. “The MBPJ should also not approve the proposal to build 18 bungalows in the area,” he added. However, he commended the MBPJ on its effort to consult with the residents on development plans. Last Friday, residents detected four landslip sites along Jalan 5/60 and similar erosion was seen near an abandoned bungalow plot at Jalan 5/64. Petaling Jaya councillor Derek Fernandez had reportedly said he would propose that the council impose a stricter process for hillside development, including the need for a mandatory independent audit by geo-technical engineers, as well as the mandatory appointment of specialist contractors with proven hillside construction experience. When contacted, Fernandez said some 50 residents attended the first consultation at MBPJ last week on a proposal to build 18 bungalow lots near Taman Petaling (Girls) Secondary School within the Bukit Gasing area. He said the residents would meet again within two weeks after receiving the geotech documents from the developer. Checks by theSun revealed soil erosion behind a shrine at the Sri Maha Sivabatrakaliamman temple at Jalan 5/64 and a fresh landslip with a “sold” sign near Fraser Towers at Jalan 5/60 which was not covered with tarpaulin. In addition, there were no signs to warn the public of the hill slope debris on the road. PETALING JAYA: Three landslips occurred along Jalan 5/60 in Bukit Gasing due to soil erosion during the rainy spell. Soil erosion had also uprooted a tree which had partially blocked nearby Jalan 5/64. Landslips are frequent occurrences at Bukit Gasing which has resulted in many residents living in fear. Petaling Jaya City Council member Derek Fernandez said the persistent landslips were a definite cause for concern. “I will be moving a motion at the council for much stricter procedures for hillside development. “This includes the need for a mandatory independent audit by geo-technical engineers to gather information, supervise and oversee the construction phases,” he said yesterday. Link to more photos here….